We are focused on providing high-quality service and customer satisfaction. With over 25 years of experience, we are confident we can meet your expectations. We are fully bonded and insured and provide services to both commercial and residential customers within the Metro-Detroit area and surrounding communities. When in your home, we wear booties over our shoes and use drop cloths. We use pet/environment friendly cleaning products. We do the little things, such as wipe and clean window frames and sills. When in a business, we use drop cloths and have the utmost respect for your employees, by conducting ourselves in a professional manner. We are careful and considerate. Our cleaning process has been refined over the years to provide outstanding results. We can clean your gutters and remove debris that is keeping your gutters from draining properly. We can clean the outside of your gutters and remove stains. It is important to maintain your gutters because clogging can cause damage to your home – overflows could introduce moisture under the shingles, which could cause rotting or other damage. If you are needing gutters repaired and/or replaced, or if you need help with installing gutter guards, we can provide a quote. We can pressure wash the exterior of your house siding to remove dirt and mildew build up. We also can pressure wash driveways, sidewalks, roofs, concrete and hardscapes (stone, etc. 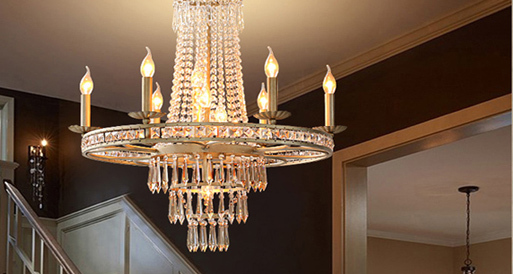 ), and other exterior surfaces removing moss, dirt, gum, stains, etc..
Chandelier Cleaning – We are experienced and very careful. Ceiling Fan Cleaning – We also oil and tighten loose screws. Let us assess your walls before you spend the big money to have them repainted. We have extensive experience cleaning windows after remodeling or new construction. Safely scraping off paint, concrete or stucco debris (from patio pouring, hardscape), or anything that might be on your glass due to work completed. We believe in providing excellent service at a fair price! We offer competitive pricing on all our services. It is best to give us a call or submit a free quote form for a written estimate, so you will know exactly what it would cost for the services you are interested in.